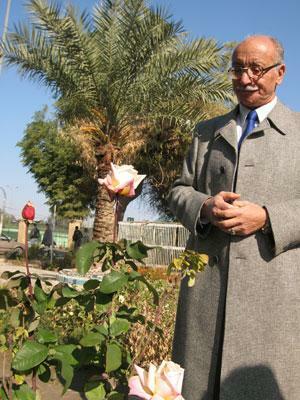 Jaafar Hamid al Ali, supervisor of Baghdad Parks, in Zawraa Park, the only operating park in the Iraqi capital.BAGHDAD — The flowers appear overnight, and in the unlikeliest of places: carnations near a checkpoint, roses behind razor wire, and gardenias in a square known for suicide bombings. Sometimes, U.S. armored vehicles hop a median and mow down the myrtle, leaving Baghdad parks workers to fume and reach for their trowels. When insurgents poured kerosene over freshly planted seedlings, landscapers swore a revenge of ficus trees and olive groves. It’s all part of a stealthy campaign to turn the entire capital into a green zone. Jaafar Hamid al Ali, the Baghdad parks supervisor, leads the offensive. He’s got a multi-million-dollar budget, along with 1,500 intrepid employees and a host of formidable enemies. There’s the fussy climate, salty soil, and nonstop violence that killed 30 of his workers in 2006. Every fallen gardener, Ali said, is a martyr in the struggle to beautify Baghdad. Ali, 62, cuts a dapper figure among Iraqi bureaucrats. One recent chilly afternoon at his headquarters at Zawraa Park, the only operating park in Baghdad, he wore a knee-length hounds-tooth overcoat, a navy Yves St. Laurent jacket, and spit-shined shoes. Someone had scribbled a flower on the nameplate that hangs on his office door. He’s a French-educated former professor who can recount by memory the history of flora in Iraq. The supposed site of the fabled hanging gardens of Babylon lies just 50 miles south of where he works. Ottoman rulers established the first official public parks, some of which remained open well into the 1920s, Ali said. In the 1930s, the Baghdad city council built a few more parks and for the next four decades worked toward a goal of allotting 160 square feet of green space for each resident. By the 1970s, they’d reached 85 square feet per person. Frequent power interruptions during the eight-year war left Baghdad residents with no way to heat their homes in the winter. Ali, by that time a high-ranking parks employee, had overseen the planting of a large forest in the Furat neighborhood. It took 12 years for the acacia, casuarina and eucalyptus to mature, he said, and just one night for locals to chop down half the forest for firewood. He recovered, but Baghdad parks did not. The Gulf War in 1991 dealt a fresh blow. Ali watched with fury as Saddam Hussein rewarded his generals by issuing presidential orders that turned the people’s parks into his cronies’ private gardens. By the time U.S.-led forces toppled Saddam in 2003, there were just 5 square feet of park space for each Baghdad resident. Acacias and tall date palms still lined many avenues in the capital — until insurgents began firing on U.S. troops from the brush. Coalition forces razed acres of palm groves, Ali said, partly for security and partly to widen the passageways for their hulking armored personnel carriers. Airport Road, once one of the loveliest of thoroughfares, remains a barren ribbon of knee-high palm stumps. Ali had written off parks work as futile and had become a successful businessmen and a member of the Mansour neighborhood council. Yet he couldn’t shake thoughts of his boyhood home, with a courtyard in the middle. His father tended the family’s grapevines, flowers and fruit trees. The fragrance still wafts through Ali’s memory. In 2004, he succumbed to his passion, took a pay cut and signed a contract to become supervisor of Baghdad parks. The task seemed ludicrous to many Iraqis living in the throes of war, but he couldn’t bear to see his city hidden behind blast walls and coils of concertina wire. The gray, bullet-scarred tableau gnaws at the soul, he said, and makes war seem permanent. Ali spent most of that first year simply refurbishing the city’s nurseries, which had been destroyed by looters in the days after Saddam’s ouster. He ordered seeds from Syria, and his staff performed tests to find the hardiest plants to withstand the rigors of war. The parks’ shoestring budget didn’t allow for much visible improvement. But 2005 brought the serendipitous appointment of a new Baghdad City Council chairman, who happened to be an agricultural engineer. Ali had found a kindred spirit. The budget allotment for parks was increased, and Ali immediately set his sights on Baghdad’s abandoned, litter-strewn traffic squares and medians. Workers planted two million flowers, shrubs and trees in the past year, he said, exposing themselves to gunfire and car bombs in the process. Insurgents intimidated many gardeners into leaving their work; others were killed. Still, the obstacles are myriad. At the Zawraa Park nursery, just opposite from a military recruiting center that’s a favored target for bombers, workers said they frequently pick bullets and shrapnel from their fragile cuttings. Explosions have shattered the office windows three times in recent months. Outside the compound, Ali spent a fortune on the latest in sprinkler systems only to see them go dry because the lack of electricity severs the water supply. Within a week, he said, the plants wither up and must be replaced. To keep them alive, workers have to call in water tankers and spray the flowers the old-fashioned way. None of this appears to daunt Ali. Even as hundreds of thousands of Iraqis flee the war, he talks of flowering trees, picnic areas and playgrounds. While corpses float on top of the Tigris River, he’s more concerned with the rich soil underneath. He’s putting the final touches on a long-term plan to build 15 new parks in some of the most violent neighborhoods of Baghdad. Another proposal calls for the construction of a “green belt” that will surround the capital with trees, six rows deep. For now, the fruits of the parks department’s labor are visible mostly in relatively safe Shiite Muslim neighborhoods such as Karrada and Shoala. That’s changing, Ali promised, with a new campaign that targets the predominantly Sunni western side of the capital known as Karkh. Karkh Park currently exists only in a blueprint that shows a verdant plot with a shopping mall in the middle, but Ali already offers cash bonuses for field managers who show him progress in the insurgent-ridden area. Ali beamed as he recounted how parks employees have slipped into the dangerous Doura and Mansour districts armed with seeds that one day will blossom into vibrant gerbera.